So Hollie has one week left at nursery and then she is off for two weeks. So I have been thinking of the things that she can make to keep her busy. We have some pom poms, googly eyes, pipe cleaners, beads etc, it could be interesting. 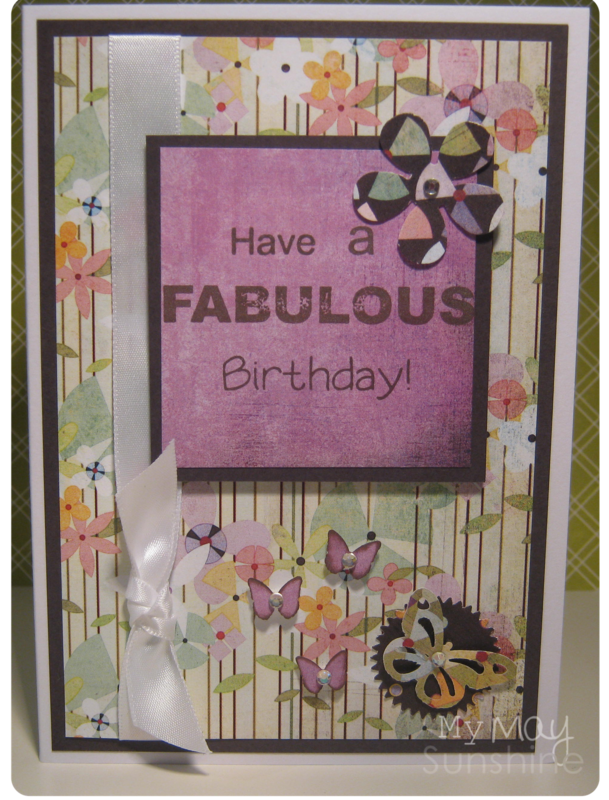 For this card I decided to do some layering of paper and card on this card as I think it shows off the patterned paper more. The sentiment is actually made from 4 phrases from the My Pink Stamper’s Fabulous Phrases stamps. There are many different styles and sizes of stamps in this set but can be mixed to make a new sentiment. As the patterned paper is quite busy already, I decided to just add a few butterflies and a flower with gems and some simple cream ribbon. Punches – Martha Stewart Starburst, 3in1 classic butterfly and Monarch Butterfly. Ribbon and gems – Local craft shop.